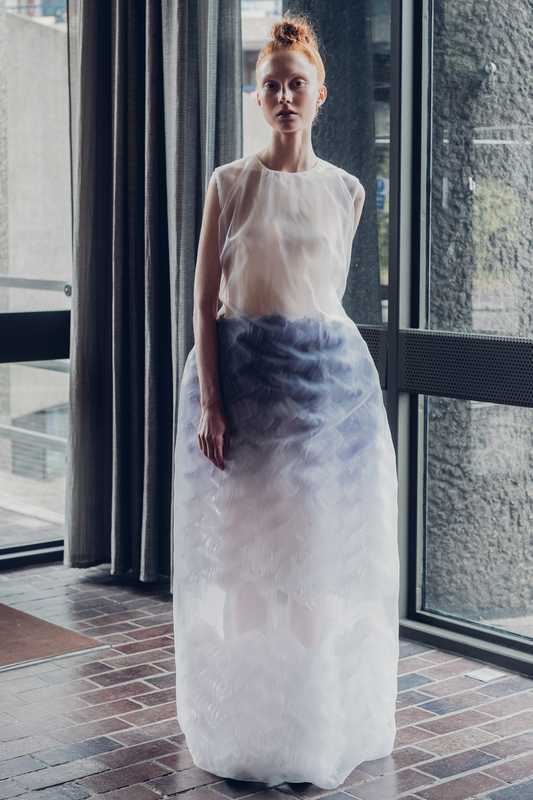 GRADUATING FROM THE ROYAL COLLEGE OF ART IN 2014, KATIE’S MA COLLECTION ‘SYNCH’ WAS CRITICALLY ACCLAIMED, WINNING THE ‘COLLECTION OF THE YEAR AWARD’ AT INTERNATIONAL TALENT SUPPORT (ITS) 2014, AS WELL AS THE ‘VOGUE TALENTS AWARD’ IN RECOGNITION OF THE TECHNICAL INNOVATION, BOLD AESTHETIC AND HIGHLY CREATIVE NATURE OF THE COLLECTION. IN SEPTEMBER 2015 KATIE ROBERTS-WOOD WAS AWARDED THE ACCLAIMED FASHION SCOUT MERIT AWARD FOR SS/16 AND LAUNCHED HER LABEL ROBERTS|WOOD. KATIE RECEIVED A FULLY SPONSORED CATWALK SHOW DURING LONDON FASHION WEEK AS WELL AS EXHIBITING AT FASHION SCOUT LONDON AND PARIS WHERE SHE WAS INTRODUCED TO THE WORLD'S TOP BUYERS. SHE FOLLOWS IN THE SUCCESSFUL FOOTSTEPS OF PAST WINNERS INCLUDING DAVID KOMA, EUDON CHOI, PHOEBE ENGLISH, AND XIAO LI. HER APPROACH TO THE DESIGN PROCESS FOCUSES ON CONSTRUCTION TECHNIQUES TO CREATE UNEXEPCTED TACTILE AND VISUAL EFFECTS. THE COLLECTIONS ARE BORNE FROM A FASCINATION WITH NATURE AND SCIENCE, BUT ARE ALWAYS IMBUED WITH A PERVADING SENSE OF THE UNREAL. “KATIE'S GRADUATE COLLECTION WAS OUTSTANDING AND DESERVED ALL THE INTERNATIONAL ATTENTION. 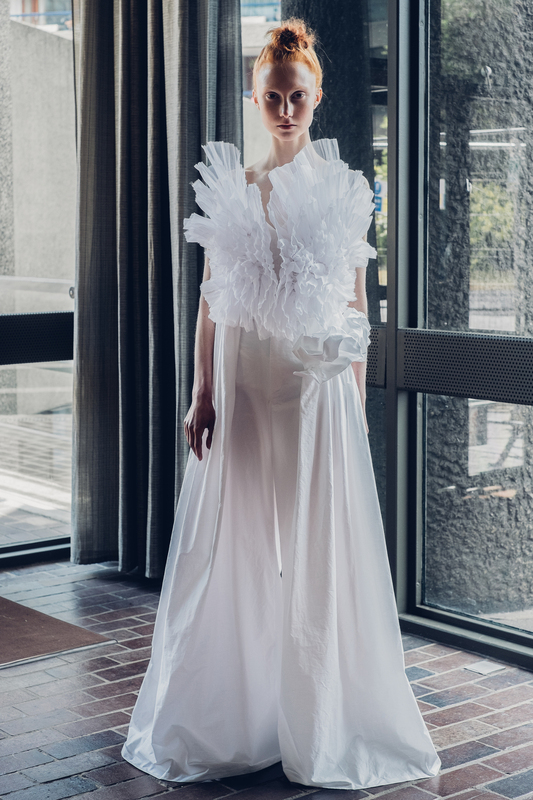 THE NEW COLLECTION SHE IS DEVELOPING FOR THE MERIT AWARD BUILDS ON THIS EXPERIMENTATION, TAKING HER CREATIVITY TO A NEW LEVEL" - MARTYN ROBERTS, FASHION SCOUT'S FOUNDER AND CREATIVE DIRECTOR.